On 17th March 1894, Maillart graduated from the Eidgenössische Technische Hochschule (ETH, Federal Institute of Technology) in Zürich with an engineering diploma. He was described as being 1.75m (5ft 9in) tall, of slight build with brown hair and a moustache, and wearing pince-nez spectacles. From graduation to the end of 1896, Maillart worked for the railway construction company Pümpin & Herzog (founded 1883) in his home city of Berne. He began by overseeing the installation of a water tunnel for the town of Stolzenmühle, some 15km south of Berne, in the canton of Berne. In 1895, he spent May to October in the design office, and then transferred to work on site on the railway branch line to Morges in the canton of Vaud on the north shore of Lac Léman (Genfersee, Lake Geneva). On 27th March 1896, Maillart moved north from Morges to Pampigny (also in Vaud canton) to supervise the construction of the first bridge of his own design — a rail bridge of 6m span. It crossed Le Veyron brook with a single arch of mass concrete, 600mm thick at the crown. The design used concrete as if it was just a replacement for masonry. Nevertheless, Maillart had had his first taste of bridge design and construction, and decided he had found his métier. On being recalled to Pümpin & Herzog's Berne office in September 1896, he began to look for another — more exciting — job. He was offered a post at the Städtisches Tiefbauamt (municipal civil engineering department) of the City of Zürich, where the chief engineer, Viktor Wenner, was a former employee of Pümpin & Herzog. 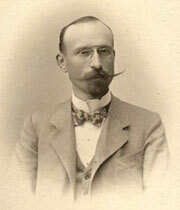 At the start of 1897, Maillart returned to Zürich — the centre of Swiss engineering — and took up his new post. He soon got the chance to work on a new road bridge over the Sihl River at Stauffacher in the city. The cantonal authorities rejected a proposal for a three-span steel bridge for the site, as they thought it would obstruct the river too much in winter, when a lot of ice passes through. In August 1898, ideas for two-span steel or masonry bridges, and a single-span steel structure, were reviewed by Maillart's former ETH professor (Karl) Wilhelm Ritter (1847-1906), who was the authorities' bridge consultant. Ritter persuaded the authorities that a two-span bridge was undesirable aesthetically, and recommended a single span concrete bridge with steel hinges at the crown and abutments. Wenner decided that the construction department would produce comparative designs for a two-span steel bridge and two three-hinge arch bridges, one of steel and one of concrete. Three-hinge arches were then in common use for Swiss bridges. This format had an advantage in that differential settlement and thermal expansion/contraction could be absorbed without distorting the structure. Moreover, such an arch could be designed using relatively simple calculations. However, using this technique to design a concrete bridge was new. Maillart's scheme for the last of the options — a three-hinge mass concrete arch — proved to be far cheaper a solution than the other schemes, and it was approved for construction. The Stauffacher Bridge (Stauffacherbrücke) was completed in September 1899 and is still in use today. Its arch spans 40m and is effectively a curved concrete slab that transmits loads to the abutments in compression. The arch is 780mm deep at the crown, 940mm at the quarter span points and 720mm at the supports. Vertical cross walls support the lightweight reinforced concrete deck. However, little of Maillart's concrete engineering is visible. Swiss architect Gustav Gull (1858-1942) was engaged to design the bridge's exterior, and he duly clad it in traditional masonry. Perhaps sensing that he would have more freedom as a designer if he worked somewhere other than with a public body, Maillart resigned from the Städtisches Tiefbauamt. His adventures in economical designs using concrete were about to begin in earnest. Landlocked Switzerland shares borders with Germany, France, Italy, Austria and Liechtenstein. Its four official languages are German, French, Italian and Rumantsch. The country is divided into 26 federal states, called cantons. The largest canton is Graubünden in the east, and the most populous is Zürich in the north. In Maillart's time, there were 25 cantons, and his structures were built in 18 of them. Swiss political structure is based on a constitution of direct democracy, drawn up in 1848 and revised in 1874. It has a two-chamber parliament —the Nationalrat of 200 elected members and the Ständerat with one or two members from each canton. Plus there's a government administration body called the Bundesrat, of seven members elected by parliament. The parliament, government and courts operate at three levels — federal, cantonal and communal. Elections are decided by proportional representation, and public influence over political processes is usually expressed through referendums. 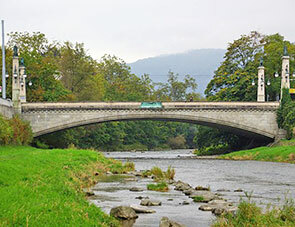 The Stauffacher Bridge (Stauffacherbrücke, 1899) over the River Sihl is clad in masonry designed by architect Gustav Gull. However, beneath lies a three-hinge mass concrete arch by Maillart, executed during his time working at the Städtisches Tiefbauamt (municipal civil engineering department) of the City of Zürich. Maillart began his working life at a time when public procurement and the awarding of tenders weren't standardised in Switzerland. For public works, such as buildings and bridges, local authorities usually specified the design or the contract price. In the latter case, tenderers were permitted to submit their own designs. And it was apparently common practice for any new designs to be verified by known academic experts. Although Switzerland rewrote its constitution in 1874, the cantons continued to operate under a diverse range of laws. Commercial law was standardised by the 1881 Federal Code of Obligations. From 1st January 1912, the Swiss Civil Code came into effect, covering all aspects of civil law. Swiss construction law remained little changed after 1912, up until 1996, when extensive public procurement legislation was passed. An Act of Parliament and an Ordinance now govern federal contracting authorities. Each canton has public procurement laws, governed by an agreement and the Federal Act on the Internal Market. These apply to its cantonal, regional and/or communal contracting authorities.